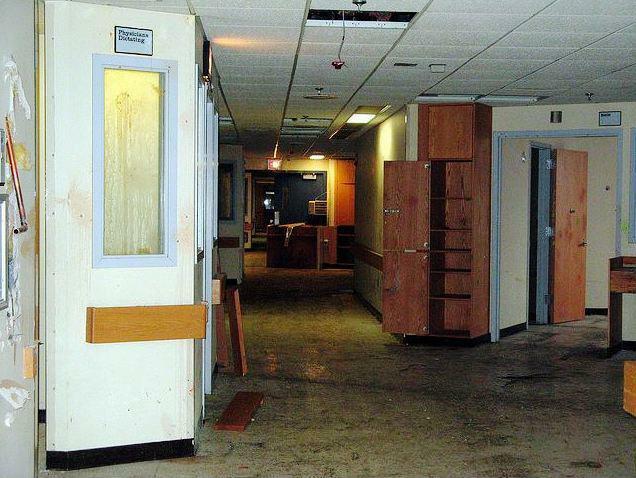 In a 2009 photograph, the interior of the former Malden Hospital building shows decay and disrepair. The hospital closed in 1999, but the property remains unsold. Hallmark Health System, which owns the former site of Malden Hospital, is suing the city, alleging that recent safety violation citations are politically motivated and an attempt by the city to gain more control over the property’s redevelopment. The lawsuit, filed Oct. 18 in Middlesex Superior Court, outlines the close involvement of political leadership with the inspection process, including Malden City Councilor John Matheson accompanying a building inspector during a recent visit to the property, and a letter sent by Mayor Gary Christenson to Hallmark Health on the same day that the order to correct safety violations was issued by city inspectors. “The mayor’s letter at least implied [and arguably expressly stated] that the reason Hallmark Health received the order was because Malden disagreed with Hallmark Health’s marketing strategy and the resulting prospect for the property’s redevelopment and not because of an urgent need to address safety concerns,” the lawsuit states. In his letter, Christenson outlined his displeasure with Hallmark’s requirement that a buyer be responsible for remediation work. “Requiring a prospective buyer to remediate the site after paying fair market value for the land and improvements leads us to believe that the property will remain unmarketable for the near future,” Christenson wrote. City officials have recently signaled their impatience with the development process for the 21-acre parcel on Hospital Road, which has been vacant since Malden Hospital closed in 1999. On Sept. 13, the City Council approved a resolution by Councilors Matheson and Craig Spadafora asking the city to look into taking the property by eminent domain. Since then, Hallmark officials have twice met with Christenson and other city officials to discuss redevelopment options for the site. A third meeting was scheduled for mid-October to discuss possibly revisiting a deal to redevelop the site for senior living that fell through in 2008, but it was canceled after the city issued the safety violations. The violations came as a surprise to the health company, according to Alan Macdonald, Hallmark’s vice president of business strategy. The orders to address the violations included restoring the building’s drained sprinkler system, a project that would likely be more expensive than the value of the property, Macdonald said. City building inspector Scott Fitzgerald cited the property for five safety violations on Oct. 15, including a lack of a functioning sprinkler system and utilities; insufficient emergency exit lighting; severe water damage; and unauthorized changes to the property’s fire alarm system. But the lawsuit says the violations are not true. The sprinkler system and building utilities were turned off with city approval in 2007 as part of a demolition permit granted after Hallmark had reached an agreement to sell the property to a company that intended to raze the buildings, the lawsuit said. The deal fell through in 2008 and the buildings remain. The lawsuit seeks to have the orders — which require that the sprinkler system be brought back online and for the old fire alarm system to be reinstalled — be nullified. Hallmark Health wants to continue discussions with the city regarding the site’s redevelopment, but to do so, the orders need to be lifted, said Macdonald. Matheson, who represents the ward where the former hospital is located, said Hallmark’s unwillingness to remediate the property stands in the way of development. The property is valued at $6.1 million, according to city records.